Gently relieve hunched shoulders and improve posture. The DonJoy Clavicle Posture Support gently holds your shoulders back to help improve your posture. Lightweight and easily worn under or over clothing. It is also recommended for immobilization of clavicle area following strain or trauma, and soft support may help promote healing of clavicle bone. Universal - one size fits all. Can this brace be upon by ones self or are two people needed? Do you have any posture support irems that do not pinch and rub raw underarms. All I have tried did that. I am looking for something to keep my left shoulder pulled back. My Rhomboid Major always feels stretched and will knot up due to my left shoulder slouching forward. Will this product keep my shoulder back in a way my muscles will develop proper memory and potentially relieve the pain. The pain is on the lower part of the rhomboid near the attachment site of the scapula. I am an average height 17 year old multi-sport athlete who has some posture problems due to sports injuries. I was wondering if this brace could be used while weightlifting (trap bar dead lift, and RDL's mostly) to prevent any more strain or injuries. Or if a more sports specific brace would be beneficial. Thank you for your question. This brace could be worn during your work out. You may find the Saunders Posture Sport Upper Back Support to be more comfortable. In an above question you state that this device is "universal" and "fits 24"-40"". Can you explain where those measurements are taken? Also, is this product latex-free? Thank you for your question. The measurement for this brace is taken around the chest. It will fit a chest circumference from 24"-40". This product is not made with natural rubber latex. Do you ship to Canada? If so, are there additional charges for shipping to Canada? Do the straps stretch or give? are they elastic? The straps are a nylon material. There is not much stretch in the materail. The straps are adjustable by use of the D-ring buckle. Thank you for your question. Will this fit my son (12 years old) with measurement of 31 inches around rib cage? The ProCare Clavicle Strap accomodates 30-36" Size Medium. The Donjoy Clavicle Support is Universal in Size, it accomodates 24-40"- Universal in Size. I have so many braces, well 4 from the health catalog we all get. The last one squeezed my rib cage to the point I could hardly breathe. NONE of these pushed my shoulders back. I tend to walk slightly bent over and want to correct that. 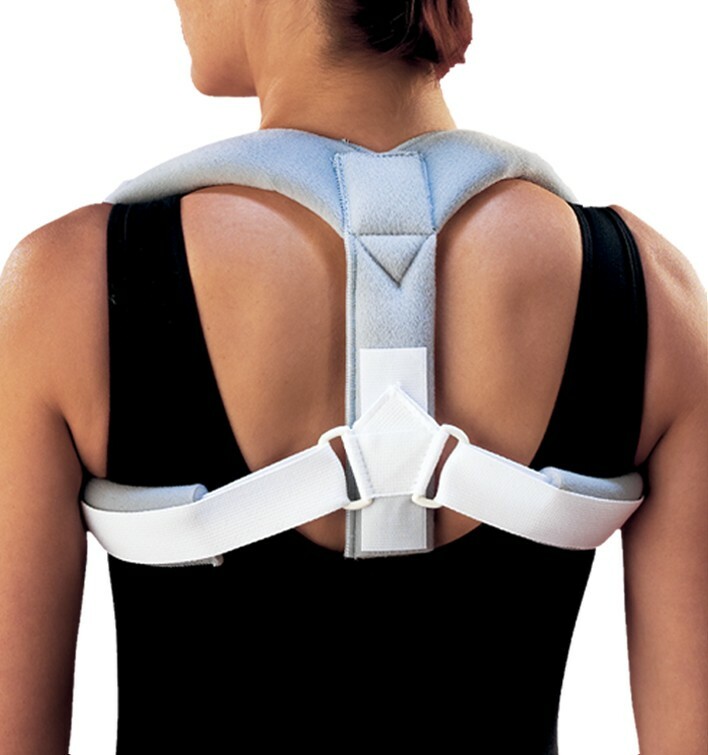 DOES this brace really push shoulders back to proper posture position??? Praying you'll say yes. I'll accept a no as well. Thanks! Have you used our Products in the past? All of our Posture Supports help you sit up straight and hold your shoulders back. We have several options. Please take a look at the options below. Can you wear this under your clothes? Yes you can wear underneath loose clothing. Please see link below for your options, certain items are more bulky due to padding. Since I'll wear this most every day , how is it cleaned ? Washable ? Please advise . We recommend hand washing with a Mild Detergent. The Donjoy Clavicle brace is applied just like a backpack. For pricing questions please contact Customer Care at 1-800-336-6569. Lightweight, self fitting and adjustable, soft and comfortable over swollen and tender injury area, comfortable over protruding fracture, all without placing strain on neck which is a problem with traditional neck supported slings. I also feel that my posture is being corrected as fracture heals. I would highly recommend this device to anyone with a broken clavicle.